School bag, check. School shoes, check. Lunch box, check. Drink bottle, Check. Name labels, check. Looks like it’s time to add some stationery to the back-to-school mix. We’ve found some awesome stationery options that might be just what you need to get the kids excited about heading back to school. I stumbled across Rock Paper Scissors quite by accident, but I’m rather glad I did. This online store is a treasure trove of way-cool stationery bits and pieces for kids sourced from the US and Japan, two countries known for their uber-awesome stationery fetishes. And Rock Paper Scissors doesn’t disappoint. Check the back-to-school apple pack (pictured top). 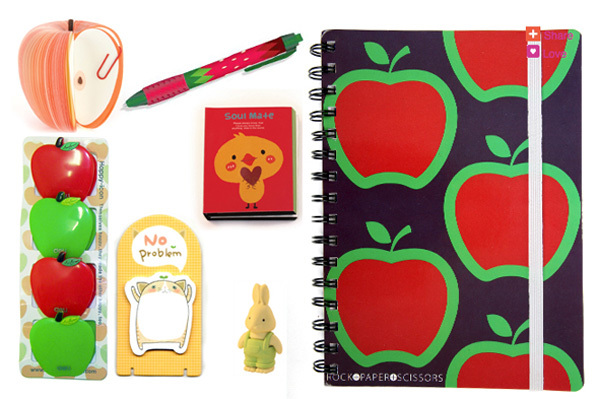 It has an apple notebook, memo book and stand, sweet apple-shaped clips, and your choice of apple sticky notes, adorable bunny eraser or pen for $17.99. Now if I’ve learnt anything being a mum to primary school-aged kids, it’s this. You can get them to do just about anything by uttering one simple seven-letter word – Smiggle. 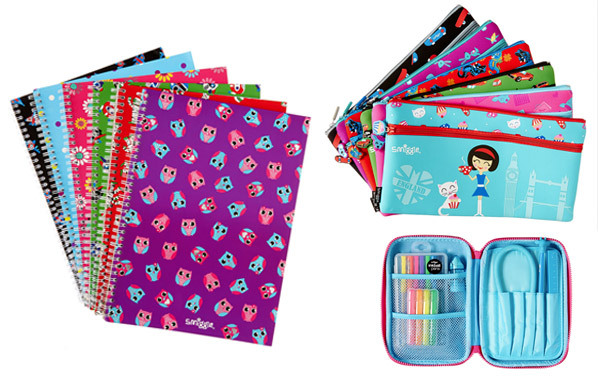 Smiggle is the bee’s knees of stationery for the primary school set – just one single Smiggle item in the school bag gives your kid instant playground cred. They have lots of fun notebooks, pencil cases, pens and the like in an always changing and always covetable collection of themes that have tons of kid appeal. And because it’s stationery aimed at kids, you can expect to pay pocket money prices. These A4 sized notebooks, for example, are $6.95 and the pencil cases $15.95, but you can pick up other pieces from a measly 20 cents! Browse the entire Smiggle range online or really win some brownie points with the kids and let them loose inside a bricks and mortar Smiggle store near you. There’s another brand too that’s a household name when it comes to drawing and writing supplies. Of course, you all know I’m taking about Crayola. All the kids at my childrens’ school get kitted out with Crayola crayons and markers in their back-to-school stationery boxes, but here’s the low-down on the best products to grab for your kids if you have to provide your own. 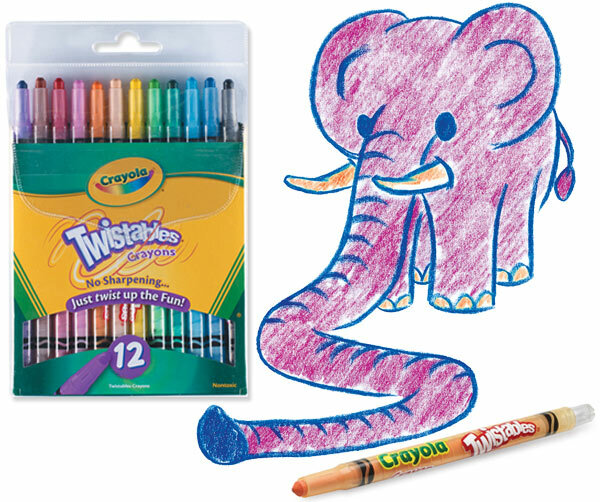 Crayola Twistables are always a favourite – there’s something about being able to wind your crayons up and down that kids go mad for – and these are much coveted for colouring and poster projects because of the vibrant colours and easy shading. A pack of 12 Twistables Crayons retails for $8.49. 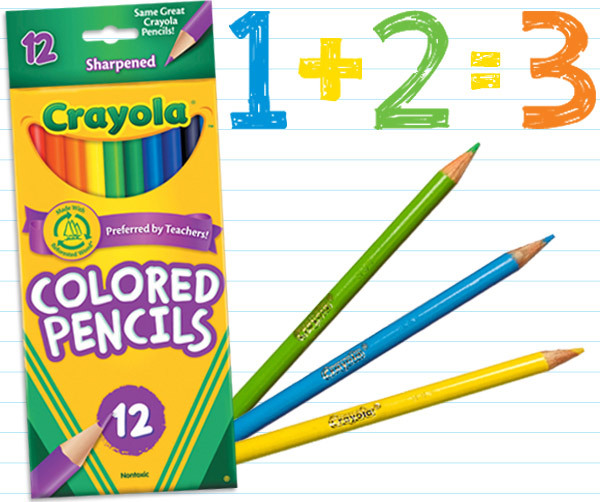 Crayola also makes a pretty mean pencil and the pack of 12 is just the right amount of pencils for junior primary kids – enough colours to create a rainbow, but not so many that your child gets overwhelmed by choice or by the responsibility of not losing them. The leads are designed to withstand a fair bit of pressure too without snapping, so they’re perfect for preppies who tend to press their pencils down hard to draw or colour. Crayola Colored Pencils retail for $5.99. 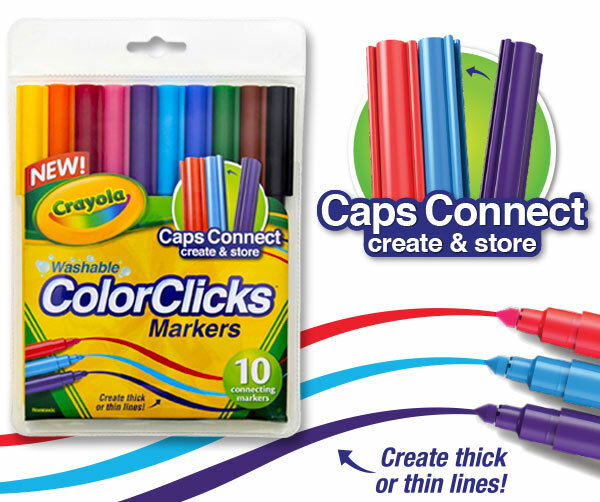 And make sure to get some Crayola Washable ColourClicks Markers too (rrp $4.99). Not only are they washable – the name’s a giveaway, right – but they can be revived when the kids inevitably leave a lid off simply by dipping the tip in some tepid water. Genius! The lids allow the markers to click together and connect for easy storage and the clever tip allows for both thick and thin lines to be drawn. All these Crayola products can be purchased at Crayola stockists nationally including Kmart and Officeworks. 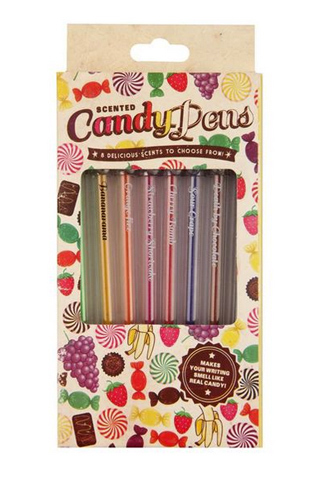 Little girls will just about jump out of their skin with joy if they’re allowed to go back to school with these rather funky candy scented pens from Typo. For $9.95 you get a set of eight scented pens emblazoned with delicious names including Bananarama, Strawberry Shortcake and Cherry Bomb. 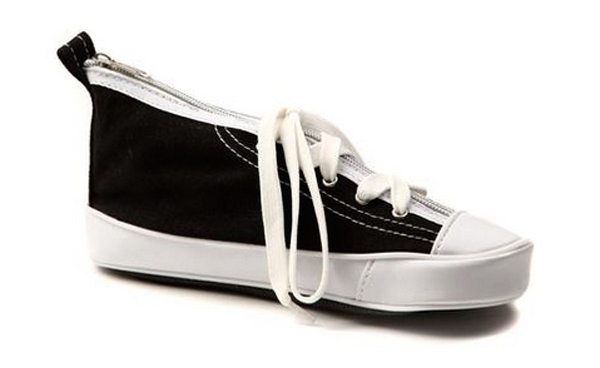 For the boys, there’s Typo’s super hilarious Run With It sneaker shaped pencil case for $14.95. Or skip the pencil case in favour of these delightful pencils in a retro-inspired tin from Eeboo. 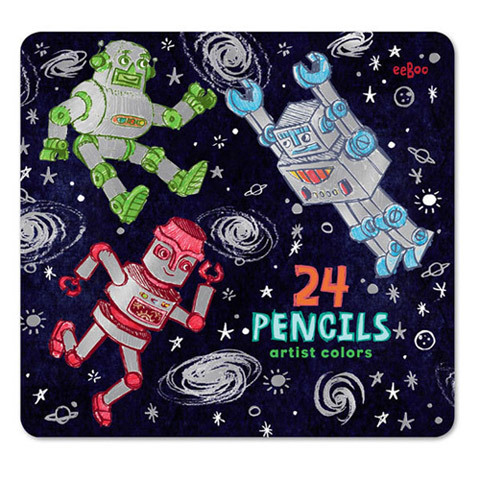 This one’s great for robot fans, and includes super rare silver and gold pencils. It costs $29.95 from Artitype, which also has tins of Eeboo pencils featuring dragons, castles or butterflies. Over at Spencil, you’ll find well-priced sets comprising note books, pencils and other tidbits in various cute animal characters for $14.95. Spencil is also known for its rather handy book covers, that allow you to slip a hard-wearing cover over your child’s school work books without having to wrangle a single roll of contact. Book covers are priced from $1 and shipping is free within Australia if you spend more than $50. Oh my, I think our cute quotient just went through the roof. 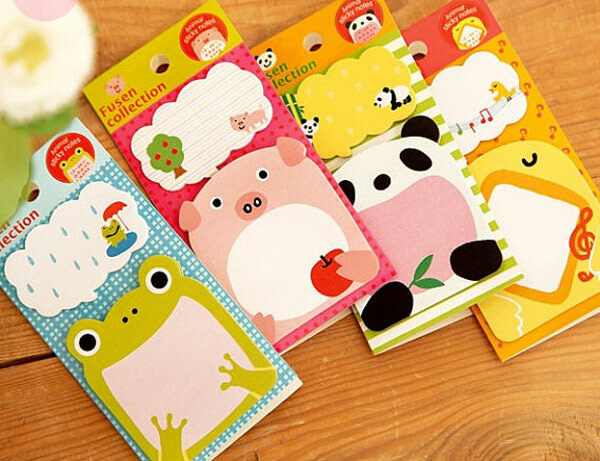 These cute animal sticky notes are great for leaving sweet little notes in their lunch box to let the kids know you’re thinking of them. They cost $2.30 each plus shipping from Etsy store 2to21m, where you’ll find heaps more adorably adorable sticky note options. Back in my day, you’d scrape a bit of paint from your pencils with a Stanley knife or whack a bit of tape on the end of your Textas to make room for writing your name. Not any more. 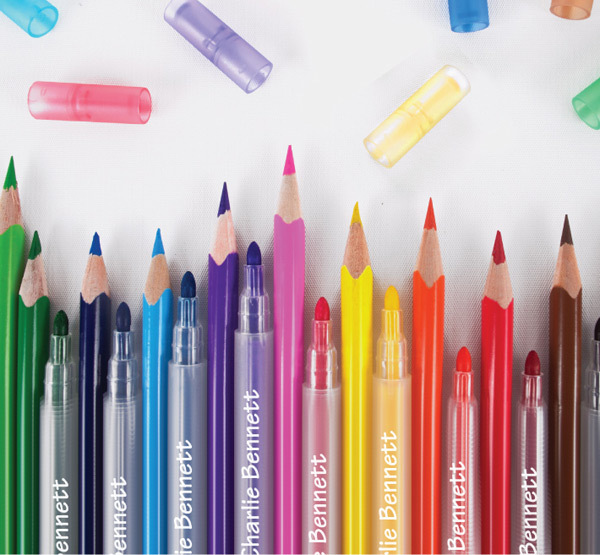 Stuck on You make it easy with personalised colouring kits that contain 10 double-ended markers and 12 pencils printed with your child’s name. The kits cost $14.95 plus post from Stuck on You. 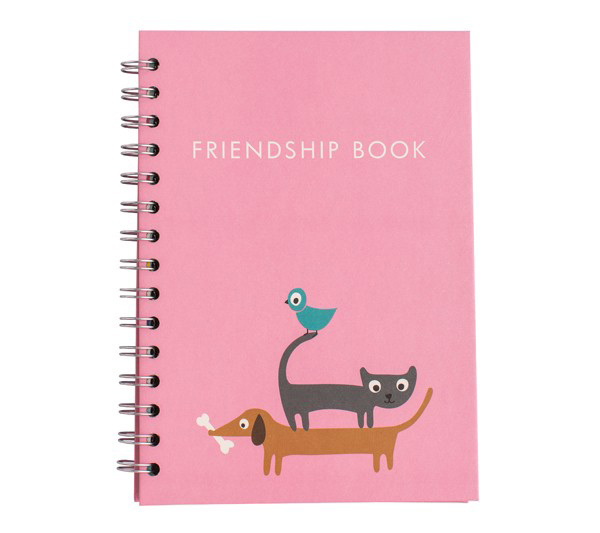 Finally, let them keep track of all the new friends they make in the school ground with this sweet friendship book from Kikki K. There’s room inside for noting all sorts of facts about their new friends, including favourite foods, nicknames and what they’d like to be when they grow up. It costs $16.95 from Kikki K, which is also the place to go for pens and other stationery items of the pretty persuasion. That’s it for our Back to School guides for 2015. We hope they’ve been a tremendous help in getting your lot sorted for the start of the school year. To all those little ones heading off to pre school or school for the first time, a big congratulations and good luck from us! And to the parents of those first-timers, make sure to pack a camera and some tissues!